Yeah, but: Perhaps PhoneBook is too obvious a name. 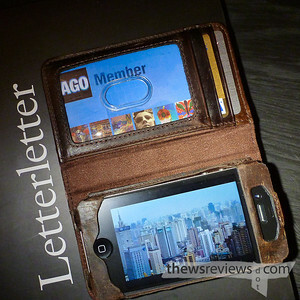 The Long Version: It's a clever gag – a classic-looking leather book-shaped object that actually houses an iPhone. Twelve South – the makers of my BookArc laptop holder – have been making their BookBook laptop cases for a while now, but the iPhone model is the first one that includes the ability to hold other things. 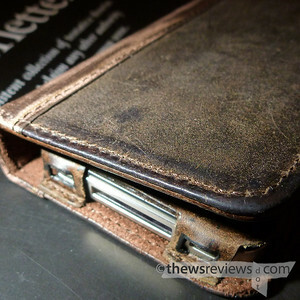 It's intended to double as a small wallet, and is equipped with slots for credit cards and a section to hold bit of cash. But you know there's trouble when Twelve South's own promotional video makes it look a little foolish: really, it's designed as a wallet, but it's too narrow to hold cash without it sticking out and being bent over when the case is closed? And to make a phone call I need to fold the case over on itself, which means I'm flashing my ID, credit cards, and money at everyone who walks past me on the street? It blocks the rear camera, and popping the phone partially out of the case to take a photo means that the case obscures part of the screen? Nifty, sign me up. Despite some reservations, I bought the iPhoneBook; despite how entertaining it is, it's not the most practical product. 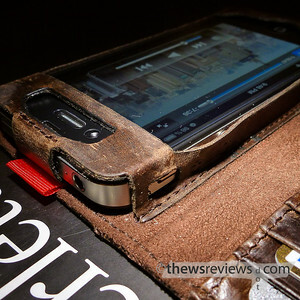 It's a good case, if somewhat bulky, with the necessary cutouts to access all of the important bits of the phone with the sole exception of the camera. It won't block the extra sensor on the white iPhone, and the mute/vibrate switch on the 4S is accessible with a carefully placed fingernail. The problems come with the wallet function, as the narrow width of the iPhone hurts its ability to hold cash, and adding more than the approved three cards impedes the cases' ability to close. The result is that my iPhone stays in its Ultraslim case whenever I expect to make phone calls or need more than a double-folded $20 bill and a couple of cards to get me through the day; that turns out to be most of the time. The BookBook case is funny, yes, but its $60 price makes for an expensive sense of humour. Where the BookBook case really excels is when I need to treat the phone as a small computer. Its hard cover lets me quickly use the phone and then put it away without needing to lock the screen, so it's perfect for checking maps or other quick activities, and its added size makes the phone much easier to hold. It's great to have if I'm out with a camera, commuting via subway, or just listening to music. 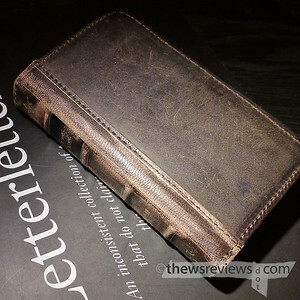 When I spend a weekend in a different city I'll use the BookBook case along with a normal wallet – well, a Mighty Wallet, actually – to keep cards and cash in separate places. So the BookBook can be very useful, and it is nice to have as an alternative. I wouldn't want to have only one pair of shoes, so why should my iPhone make do with only one case?